Be they creatures of land, sea, or air, most animal species migrate. Whales, salmon, songbirds, and butterflies all travel thousands of kilometers to and from breeding and feeding grounds every year. Theory and lab experiments suggest migrating en masse can help animals find their way. Creatures traveling together are thought to pool the many directional estimates of the members of a group, in essence tapping into the "wisdom of the crowd." So goes the hypothesis, anyway. Testing it is not easy. The challenge of actually tracing the individual trajectories of group-traveling animals in the wild has kept the available data sparse. "Technology is about to change this," says SFI Omidyar Fellow Andrew Berdahl. 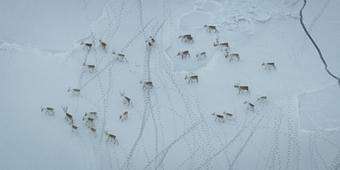 He has been awarded a National Science Foundation grant to use airborne drones to study a caribou herd as it travels from its summer territory on Victoria Island above the Arctic Circle to its winter grounds on mainland Canada. The Dolphin-Union herd, a migratory population of barren-ground caribou in northern Canada, "is an excellent test case for collective navigation because they face a unique navigational challenge annually as they traverse treacherous ice bridges," says Berdahl, referring to autumn, when the herd congregates on shore and ventures out on newly frozen ice to cross the 30-plus-kilometer-wide Dolphin and Union Strait. "The idea is to use unmanned aerial vehicles – drones – to film animals from above, then use computer vision software to track individuals," he says. Once he has the trajectory of each animal in a group, he can work out interaction rules between individuals and explore how these rules scale up to group functioning. He is interested in differences in how group size affects crossing speed and success rate, and whether the animals have different social interactions on and off the ice. Berdahl suggests that large groups may act as a distributed sensor array in detecting environmental gradients – in this case, ice thickness – or that individuals use the social information of where others have crossed in deciding which path to take. Why do migratory birds sing on their tropical wintering grounds?